Set on the quiet main street of Stanhope, NJ, you will find the unique Blue Heron Antique Shop, which has a wide array of collectibles, lamps and vintage jewelry for sale. It’s a small shop, but chock full of treasures lovingly collected from antique dealers and estate sales. 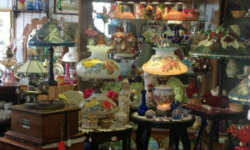 The owners, Marv and Marion Murdock, are extremely knowledgeable, and will take the time to discuss the history of each item. Anyone looking for an antique Tiffany-style glass lamp should look no further. The Blue Heron has quite a variety suitable for everyone’s taste and budget. Although there is not much larger furniture in this store, what’s there is unique and exquisitely crafted. There’s always at least one vintage phonograph. Leave yourself plenty of time to browse. There’s a lot to see, and the history of the pieces is fascinating. The shop is closed on Mondays, but open at 11:00 a.m. Tuesday through Sunday. When visiting the Blue Heron, make sure you leave plenty of time to learn about the items you select. The proprietor is a wealth of historical information, and he's eager to share his love of antiques.